Media Links is the foremost manufacturer of transmission equipment for delivering, receiving , and transporting rich content, whether it’s data, video, audio or a combination of all three. 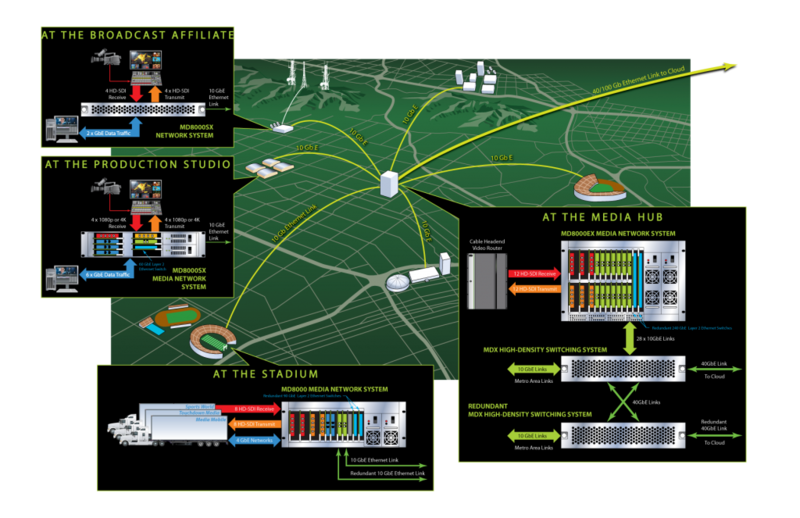 Media Links supports providers of high-performance networks for bandwidth intensive applications by powering all-digital switching and transport infrastructures for all types of media content. Such as financial exchanges, data centers, stadiums, media and content hubs, carrier exchange points, wireless towers and enterprise locations. Utilizing a fiber-based solution for media aggregation and distribution via dedicated Ethernet and DWDM network infrastructure. Securing dark fiber or wavelength-based transport and managing their own primary distribution media network. The Media Links transport solutions ensure that many different services can be distributed over a common 10GbE IP / Ethernet / SONET / SDH / DWDM network infrastructure. This results in a reliable and reduced cost of distributing content over a metropolitan area (as well as nationally if required), and ensuring distribution is in a highly scalable manner. Media Links transport equipment deployed in this type of application minimizes bandwidth usage and provides real-time dissemination of a continuous media stream from source to multiple destinations and back again.